I've had this design floating around my head for awhile now, and am excited to offer it as a full-color pattern featuring my Veranda line, which ships in August. Garden Paths was really the inspiration for the entire pattern line. It looks like a complex quilt to make, but it really isn't, so it is great for the sewer who has explored the basics of piecing (rectangles and maybe some triangles) and wants to take the next step. Sara at Sew Sweetness tested this pattern for me and you might want to hop on over and see what she has to say about it. Deborah Norris of Gastonia, NC did a spectacular job on the quilting - I LOVE the freehand roses and leaves she quilted down the white areas! I'll be printing the patterns in just a few weeks and will be shipping to your local shops in June. For those of you without a local shop, Kimberly at Fat Quarter Shop will have them all! If you like to plan ahead, this pattern measures 68"x 96" and uses one roll-up of 40 (2-1/2") strips, 3-3/4 yards of background fabric, 1-1/4 yard of inner border and accent square fabric (1-3/4 yards if you like to fussy cut), and 1-1/2 yards of outer border fabric. 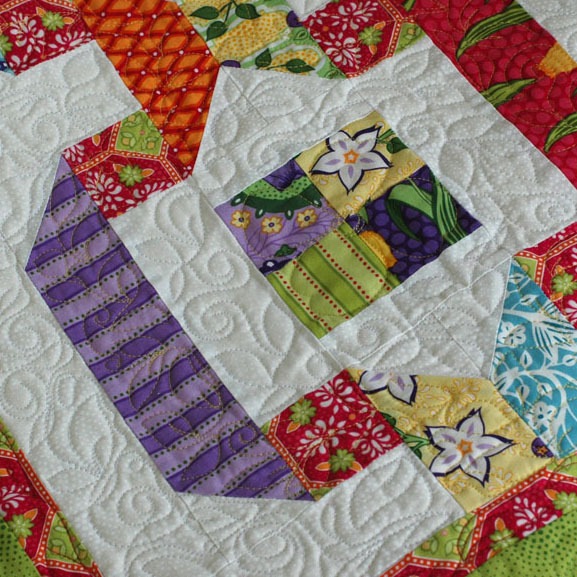 Since this pattern is special to me I'm posting it over on the Blogger's Quilt Festival. Pay them a visit to see all the wonderful projects people are working on! This pattern is what really caught my eye on the festival. I love it! 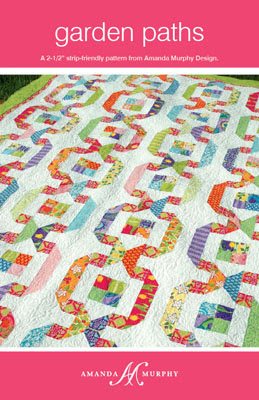 And the quilting is to die for! I loved seeing this in your booth...one of my favorites for sure! Lovely. What a beautiful showcase for your line. 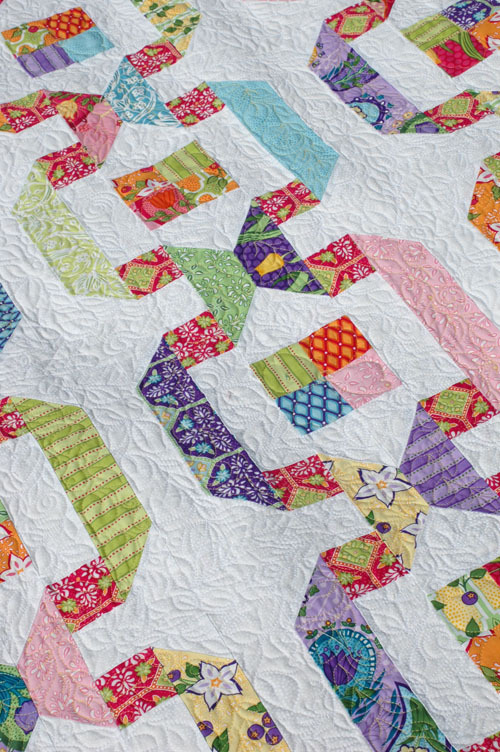 Love this pattern, and oh mgosh that quilting! WOW! I really like this design! It's nice to see something fresh, not just the same old thing redone. I have been looking and looking at books, but it seems that most of the quilts are just a new fabric line of the same old blocks. I don't need a $30 book just to change the fabrics in a quilt pattern. Thanks for a fresh view...and that quilting is devine! I totally agree with the previous commenter, it's so wonderful to see a fresh new pattern instead of the same old blocks/designs! I am in love with your quilt. I LOVE the pattern and the fabric is beautiful. Great job! This pattern is wonderful! Love it! Looks like great fun. Beautiful quilt. It reminds me of folding ribbons. I also love your fabric. What a lovely quilt. 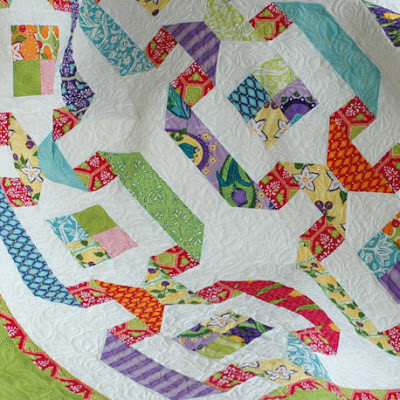 I really like the pattern and the quilting is very nicely done. Congratulations. Love this one, this one is on my to do list! Love your patterns. Your quilts are so fresh and lovely.